As an elder law lawyer Fairfield County, CT trusts can attest, nursing homes could be legally responsible for patient death or injury if it occurred in the nursing home. It is important if you have a loved one in a nursing home that you are educated on nursing home liability regulations and laws. In situations where the nursing home may be liable legally, patients or their families could be eligible for financial compensation. The compensation they could receive would be able to be used to reimburse patients and families for suffering and pain for an incident as well as covering medical costs. If you have a loved one in a nursing home and feel their nursing home should be held liable for an injury or even their death, you may want to contact an attorney at Legal Sweeney. 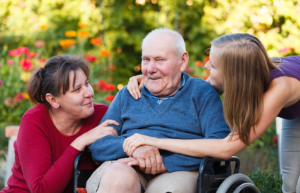 An elder law lawyer Fairfield County, CT can turn to from Legal Sweeney has many years of experience in nursing home law and fighting for the rights of nursing home patients. When a nursing home accepts a new patient, they take on a level of responsibility. This is known as the “duty of care”. It is the nursing home’s responsibility to provide patients a reasonable level of care to provide them with a safe environment and protect them. If the nursing home is unable to provide the level of care, it could be held liable for any injury that a patient could sustain while they are under the nursing home’s care. One of the main arguments in nursing home liability that an elder law lawyer Fairfield County, CT trusts commonly encounters is the varying definitions of reasonable care. The nursing home staff or management must have violated their duty of care expectations in order to be found responsible for a patient’s injuries. This typically happens when a nursing home staff member acts carelessly or negligently when performing a task that is expected of the nursing home or just simply does not perform an expected task which then led to the resident’s injury. When trying to determine if the nursing home should be held liable, there needs to be evidence that the nursing home did not meet the requirements of care and because of that the patient was injured or died. Nursing home liability laws will usually find the nursing home liable in instances of negligence or medical errors. There are a few factors to consider when deciding if a nursing home is liable, as an elder law lawyer Fairfield County, CT families need can explain. Typically, the nursing home will be found liable if there was an action they should have done to prevent the accident from happening. For instance, if a patient fell and became injured, the nursing home may or may not be found liable. If the patient was properly supervised and they had proper handrails and other precautions, the nursing home may not be liable. However, if the resident was supposed to be attended and they were not or if there was a spill on the floor, the nursing home could be found liable. When a patient or their loved ones believe the nursing home should be held liable, they hold the burden of proof. This means they need to provide evidence to show that the nursing home did not maintain the patient’s safety and because of this, the patient was injured or died. By working with an experienced lawyer from Legal Sweeney, we can help direct you through state and federal laws to help determine the liability of the nursing home. If we believe the nursing home could be responsible for you or your loved one’s injuries, we will work to attempt to earn compensation for the pain and suffering. The team at Legal Sweeney will work on your behalf to try to ensure those responsible are held liable. Contact an elder law lawyer Fairfield County, CT can look to today to make an appointment. If you are considering an in home elder care nurse to join your family, you should consult with a, elder law lawyer to be aware of the legalities your loved one may be facing in Fairfield County, CT. Unfortunately, Connecticut elder law is often misunderstood, and there are countless myths surrounding elder law that could put you and your loved one in jeopardy. If you believe these common misconceptions, you could be losing out on financial compensation and legal protection for your family. Luckily, an elder law lawyer from Sweeney Legal in Fairfield County, CT is here to help. Here are some of the most common myths about elder law that you simply shouldn’t believe. As the name implies, elder law attorneys have specialty experience when dealing with the law for seniors. Unfortunately, their name can be a little misleading. An elder law lawyer serving Fairfield County, CT can help just about anyone that walks through their door. This is especially important for young couples who plan to save for retirement or those who need help in assisting their elderly relatives. This means you also don’t have to wait until you reach a certain age to speak to an elder law attorney. Though the name implies they only help elders, this couldn’t be further from the truth. Additionally, elder law can also help an individual navigate the different costs of healthcare and personal injury while also organizing business succession plans and asset protection. Their expertise ranges anywhere from finances to retirement planning. An elder law lawyer for Fairfield County, CT will work hard to make almost every aspect of a senior’s life easier as they transition into old age. A living will is essentially a list of instructions that determine the decision-making process at the end of one’s life. While this is a good document to have, a living will is only one part of the process. An experienced elder law attorney will help you handle this difficult terrain with ease. In fact, the living will rests on a number of factors at the end of your life, namely whether or not you’re permanently unconscious, incompetent, or suffering. It also doesn’t allow for your chosen agent to act in any other situations as a decision maker for your well-being. If you want complete coverage, you should speak with your attorney about a healthcare power of attorney to make these important decisions. This is one of the most prominent myths of all. In the event you die, it’s unlikely that your estate will be subject to the federal state tax. Even if there is an inheritance tax placed on your family which deprives them of some of the funds, this tax rate is often much lower than the aforementioned federal tax rate. Truly anyone can benefit from the use of a trusted elder law lawyer on top of an in home elder care nurse in Fairfield County, CT. Please contact Sweeney Legal today if you have any additional questions. The act of writing a will can be intimidating. Understandably, few adults are comfortable with the process of thinking about what will happen to their assets after they have passed away. Nevertheless, it is critically important to draft a legally enforceable will, otherwise one’s wishes remain unknown. And even if a makeshift list of one’s preferences has been made or verbally communicated to others, only properly executed wills are virtually guaranteed to be enforceable and ultimately respected after an individual has passed. As a result, it is important to work with an experienced estate planning or elder law lawyer in Fairfield County CT when drafting your will. One of the benefits of working with a Fairfield County, CT elder law lawyer on your will is that he or she will be able to advise you about what matters you generally should and should not address within the body of the document. Wills are important estate planning tools, but they are not the only tools that the law uses in order to enforce an individual’s wishes related to the end of life and its aftermath. As a result, it is not appropriate to deal with every relevant matter within the body of a will. There are subjects that are best addressed elsewhere. Depending on the specific nature of your wishes, an attorney will be able to advise you of alternative estate planning tools and methods accordingly. Wills are primarily concerned with the transfer of property from an individual to his or her beneficiaries after death. As a result, it is generally a good idea to avoid subjects that are not directly related to property in this way. For example, funeral preferences, medical care considerations related to end of life care, guardianship arrangements for minor children and power of attorney designations should not generally be made within the text of a will. If you hold property jointly with another individual or multiple individuals, you should discuss these assets with your elder law lawyer in Fairfield County, CT before including them in your will. Jointly held property tends to be a complex asset and it may or may not be appropriate to address it within your will. Similarly, if you have already designated someone as a beneficiary of a financial policy within the body of related documentation, you likely do not need to address such designations in your will. Life insurance policies, retirement accounts, etc. tend to function separately from individual estate planning tools and will be enforceable in their own ways. If you are interested in creating a will, please consider reaching out to an experienced estate planning attorney for assistance. Drafting a will may seem straightforward, but there are certain protocols that must be followed in order to ensure that it is treated as legally enforceable and is therefore ultimately respected. Working with an experienced elder law lawyer in Fairfield County, CT will allow you to feel justifiably confident that your will has been properly executed and that its contents conform to relevant state law. In addition, an attorney should be able to advise you in regards to other estate planning tools that may benefit you and your family moving forward. For more information, call Sweeney Legal today.